Oh my, again I made something different than my fellow Dorista's this week... but please forgive me. Everyone is making a wonderful Caramel Almond Custard Tart... but my daughter is allergic to nuts and my son is severally lactose intolerant. That would have left my husband and I to eat a rich tart with out any kid help, not good. 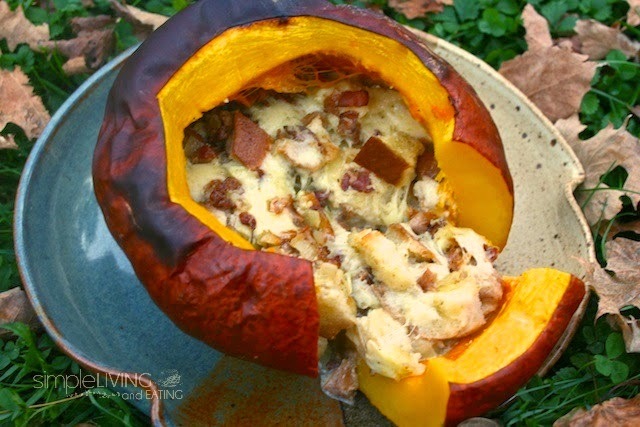 So, in keeping with the season I decided to make a recipe that was made before I joined this cooking group: Pumpkin Stuffed with Everything Good. The title is not kidding. 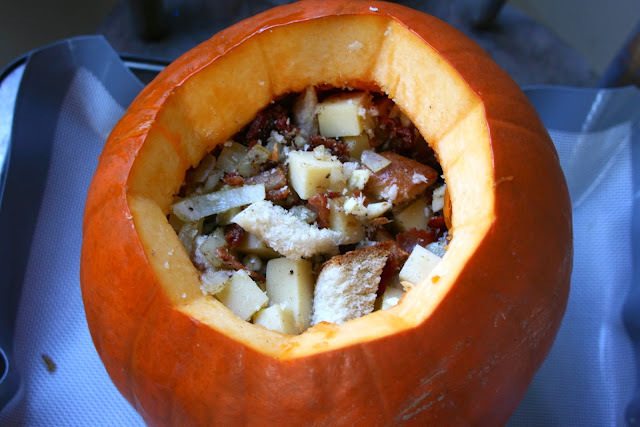 You carve open a pumpkin and fill it with bread, cheese, bacon and cream. Then you put the cap back on it and bake it for two hours. The result is a cool looking, and delicious Autumn meal. I warn you it is rich. One 3 pound pumpkin easily feeds a family of 4. Pumpkin before it is baked. Note: on selecting your pumpkin. I originally bought a sugar pumpkin. They are know for their flavor, very good for cooking. But I forgot to knock on it to check that it was hallow. You need a hallow pumpkin, so you can stuff it... so make sure to knock first and you won't have to ask questions later. Oh Diane, that looks amazing! Isn't it the coolest looking meal. My son who is not a big squash person ate it because it looked so neat. Great idea... I guess you can use any kind of squash. I remember how much I enjoyed this when tasting it! It seemed a strange recipe, but surprisingly delicious! Strange but the inside tastes like the top to French Onion Soup. 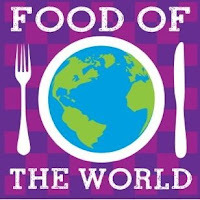 I hope you'll check out on Friday the other members of French Fridays with Dorie and see how their tarts came out... by the way Lisa, I think you might enjoy this cooking group you should give it a try. I have learned so much about cooking from being part of this group. Beautiful and such a great presentation as well! I think it so too.... it looks really neat to bring a whole pumpkin to the table and when your guests get a taste of the filling they won't be disappointed. The first time I made this for FFWD, I had company, and it was a huge hit!! I made it again for Thanksgiving that year, and my pumpkin was not as sweet and it was not quite as good…however, we all still enjoyed it! I just bought some sugar pumpkins last week to make them again! This is one of my favorite recipes in the book! Your’s looks perfectly delicious! Glad this was a hit! Thanks Kathy... the filling is amazing, but your right about being careful with the pumpkin you buy. It definitely needs to be one raised to cook. I'll have to try this one again. When I made it before, my pumpkin wasn't so tasty. The filling was great though. Glad that your family enjoyed this one. Yeah, I think you have really be careful about finding pumpkins that are for eating. The carving kind have no flavor. We really enjoyed that pumpkin when we made it and you have reminded me to enjoy it again this season ! Thanks Tricia it is such a cool looking Fall dish. I am in the hunt for a small pumpkin this year. When I first made it, I had a 4+ pounder for just my husband and me Your French onion flavor profile intrigues me. I found the pumpkins in a small green market. The grocery store only had 5 pound plus ones. Woohoo, this is so gonna be on my catching-up list! Have to bake two, one for home and the other gifted! Great idea... I would love to bring this over someone's house... what a surprise. The filling alone is worth making it. Oh my I hope the pumpkin mishaps weren't too bad. Good idea about the lactose free... still have my daughter with the nuts. It is hard to make things that not everyone can eat, especially desserts. Isn't the coolest looking dish... do you have good squash/pumpkin where you live? Hi Diane. I haven't made this yet but I plan to for Thanksgiving. Yours looks wonderful! It will make a great presentation for Thanksgiving. Great idea. Thanks for reminding me about this one. It was one of my favorites! Wonder if I have time for a repeat. Well my son usually goes into our costume box on Halloween and pulls something out: Voila: Viking Pirate. My daughter on the other hand, has been planning her "Barbie Zombie" costume since June, so she doesn't need any help from me. But some how life is busy with kids.. maybe its just all the cooking and laundry. PS: How did you cut open a non-hollow pumpkin? You must be strong. This looks like a wonderful dish! Thanks for the post. What a lovely presentation for your Stuffed Pumpkin, a very special treat. Hope you are having a great weekend and thank you so much for sharing with Full Plate Thursday. Oh my gosh! This looks so yummy! I'm ready to run out and get a sugar pumpkin for this fabulous treat! I hope you can find one. Any kind of eating pumpkin will do. Enjoy. I'll be including this post in my Hearth and Soul features tomorrow, Diane. 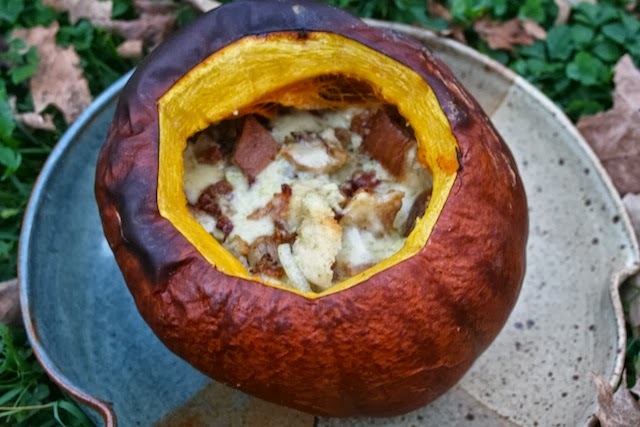 I've never had stuffed pumpkin, but this looks absolutely amazing. I'm sure it would be rich as you say, but what a lovely treat! As long as you can find an eating pumpkin I think you will find it really delicious. The filling can be used in any squash. Thank you so much for featuring it.